Touchdown...in the Valley of the Sun! 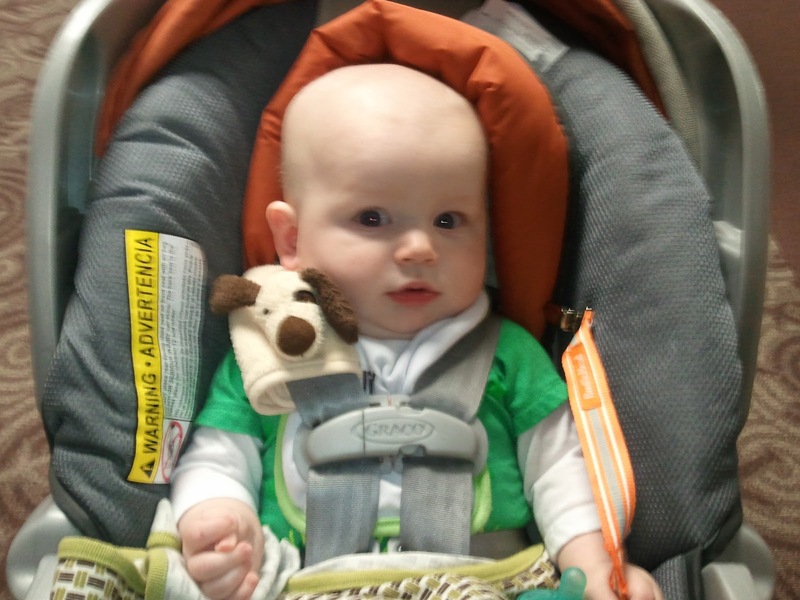 Ethan had his first airplane ride on Saturday as we left Nashville to head (nonstop) to Phoenix, AZ. We left at 4:10 in the afternoon and landed around 6:35 (MST) in Arizona. Ethan was a real trooper on his flight -- we fed him a bottle on the way up, then he slept and played a little bit with Cayne before I fed him again as we started our descent into Phoenix. The most exciting part was that Ethan had a diaper blow-out on the way down and while his diaper was leaking, our plane was stuck on the tarmac waiting about 15 minutes for another plane to get out of our gate...not fun. Lucky for me, Cayne was holding him! We had lots of luggage to maneuver at BNA. It took us a while to get our bags (the Phoenix airport is slow) and then we had to ride the rental car shuttle to the separate building where all the rental car counters are to pick up our car. I had reserved a minivan but the company (Thrifty) didn't have any minivans available. After "throwing a wobbly" (according to Cayne) when they tried to "upgrade" us to a small SUV (a Ford Escape), I insisted we needed seating for 7 people in the car we rented, just like the minivan I reserved was supposed to provide. 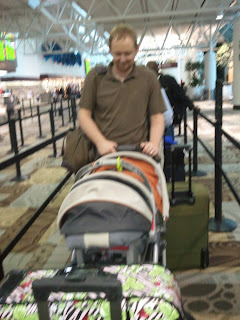 Honestly, I'm not even sure our luggage would have fit in the Ford Escape with the baby! Anyway, they relented and gave us a Chevy Traverse LTZ. It was really nice to ride in and drive! Because it was the LTZ model we had the fully adjustable leather seats (with seat warmers and coolers), a rear camera with cool night vision and a beeping indicator when we got close to other cars while backing up, we could open and close the truck door using the key remote, and it had a "memory" function on the seat adjustments. We've been thinking of eventually upgrading our car to either a Traverse or GMC Acadia so I was super excited to get to have an extended test-drive of this car. And we loved it, so someday we probably will get one of those two cars (they are pretty much the same). By the time all of that was done and we had grabbed some dinner to take to our hotel, it was almost 9:30 when we checked in. We all settled down for the night, although Ethan did wake up once in the middle of the night and wouldn't stop crying...I think the dry heat made him thirsty because after feeding him a few minutes, he settled down and eventually fell asleep and stayed that way until morning.